Several years ago the question was asked whether triple glazing might also be an unrivalled option on large surfaces. Since then it has become the most common standard in quality insulation glass. But is there really no alternative? Audi Academy, Ingolstadt. The façade of the building was given two types of sun-protection glass. The ground floor has INFRASTOP® Brillant 70/35, a glass with excellent 70% translucence for optimum lighting in the ground floor rooms. 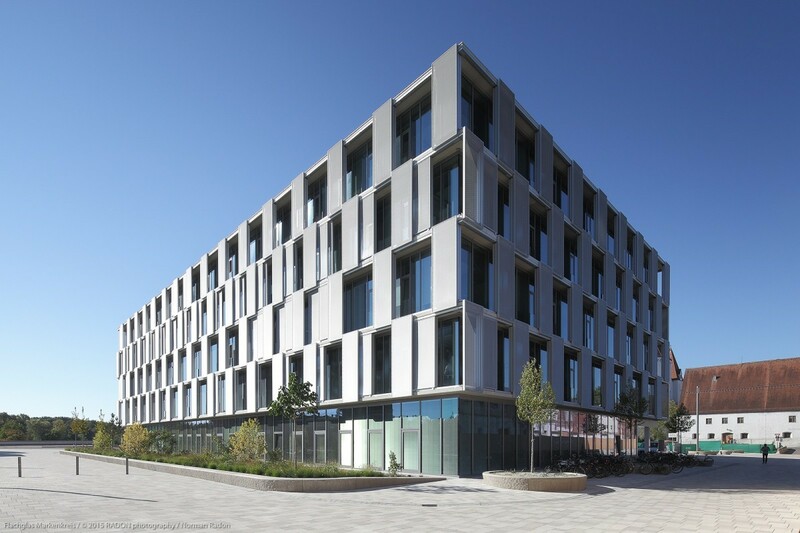 On the upper floors the architects decided on sun-protection glass – INFRASTOP® Brillant 50/25. As well as featuring a low level of total energy transmittance (25%), this glass type also persuaded the architects with its good visual impact. Vacuum insulation glass (VIG) with its low E-coating and Ug values of 0.3 W/(m²K) has been under discussion for many years now as a smart, lightweight alternative, although it is still not available as a marketable product. Weighing about 50% less than triple glazing, such insulation glass was clearly in the lead. Various research teams – also in Germany and Switzerland – were given the task of eliminating the blatant weakness of the glass, e.g. in the edge seal of VIG, and of paving the way for mass production. The VIG project ran from 2004 to 2006. Another project, entitled Production Engineering for Vacuum-Insulated Glass (ProVIG) ran from 2007 to 2011, sponsored by the German Ministry for Economic Affairs and Energy. The final report has now been available since January 2012. Next, a research project called Winsmart was launched in August 2012, sponsored by the EU with EUR 3.8 million. It is designed to look at all the various multifunctionality aspects of VIG. The results have been impressive, and the project is due to be completed in September 2016. We do of course need to remind ourselves that vacuum insulation glass has been made and used in Japan (Pilkington) and China (Synergy) for quite a while. Unfortunately, however, such glass has been relatively short-lived until now. 25 years should really be the minimum. One reason has been the inflexible edge seal which was unable to compensate for thermal strain. Since then the Chinese and Japanese have achieved improvements and created an edge seal in parallel with the glass surface and consisting of thin, outwardly protruding sheet metal. This seal is tightly bonded to the glass. The valve is situated in a hole in the VG unit. The filler gas is either argon or krypton, and the outer window pane is a low-E glass. The Chinese company Synergy is currently advertising for its products with a total thickness of 6.2 mm and a Ug value of 0.3 W/(m²K). East Asian manufacturers even speak of dimensions up to 2.8 x 1.8 metres. Bonneshof Office Center, Düsseldorf-Golzheim - The transparent structure was given an additional glass shell. Depending on the direction and the interior, the architects used black “photovoltaic panes” and “climate panes” with white print for the secondary façades of the B.O.C. Not only does this produce less heat, but it also creates a pleasant, variable lighting ambience within the building. So why has this product still not gained widespread acceptance? The issue has been under discussion in the industry since 2001, and research is still taking place. This shows the complexity of the underlying technologies and the obstacles that need to be overcome. The Winsmart research project, which is still in progress, is seeking to solve the problem of the edge seal through the use of tin. A liquid tin alloy is injected into the edge area between the panes. To create a tight glass-tin seal, the frame is briefly exposed to a suitable electric current. Moreover, the Winsmart project also seeks to ensure multifunctionality. To obtain genuine benefits, the new quadruple glazing apparently requires new techniques and products, e.g. pre-stressed thin glass, anti-reflexive coatings or indeed pressure compensation. “The solution is obviously neither quadruple glazing nor indeed triple glazing with an extra pane,” Feldmeier continues. The general principle can be illustrated by the INFRASTOP® III Brillant 45/24 with its sun-protection coating whose outer pane strongly reflects the infrared radiation of the sun. 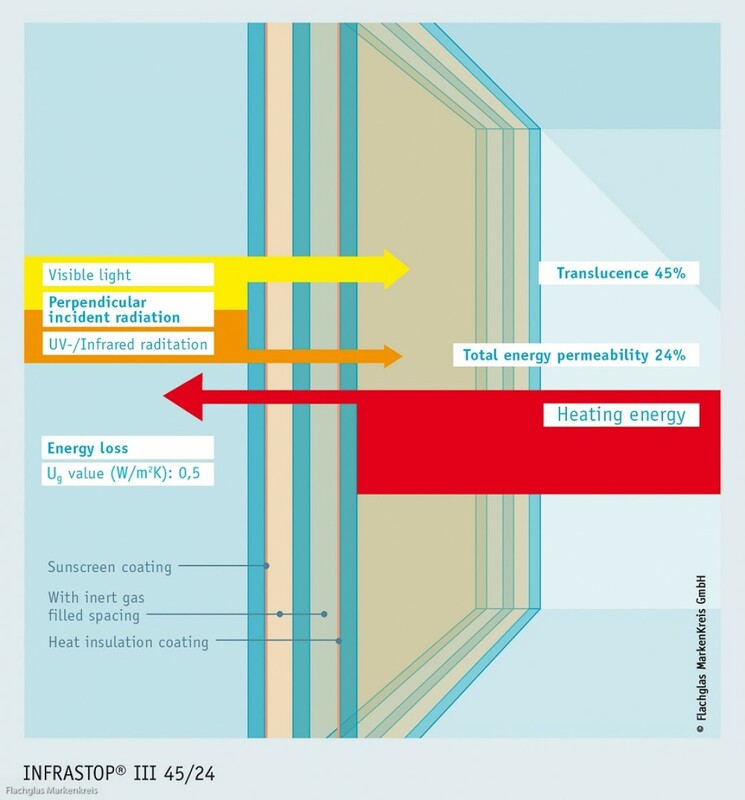 Any loss in heating energy is substantially reduced by the thermal insulation coating of the inner pane. Both effects are enhanced by the spaces between the panes, which are filled with inert gas. 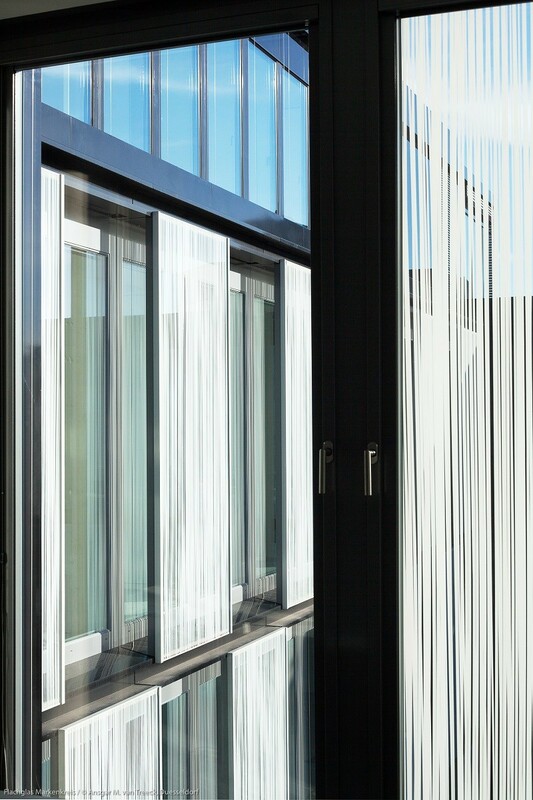 The fact is that quadruple glazing is already available on the market, as SGT GmbH in Tauberbischofsheim has developed a quadruple glazing product based on thin glass, And the technical specifications are impressive: with a structure of 2/2/2/2, 12 mm spaces and a Ug value of 0.3 W/(m2K), its total weight is no more than 20 kg/m3. Ultra-thin glass here means thermally pre-treated thin glass with a thickness of 1.6 mm – the same type of glass that is used on a smart phone. Unlike 4 mm float glass, it is very light – weighing only 15 kg/m2 – while also being strong, highly elastic and requiring very few resources. Also, manufacturing costs are apparently 15% lower, and CO2 emissions 45% less than with similar insulation glass. Here, too, the aim is to reach a Ug value of 0.3 W/(m2K). The opening casement will no longer have a frame. The fittings of the casement are embedded within the insulated edge seal. 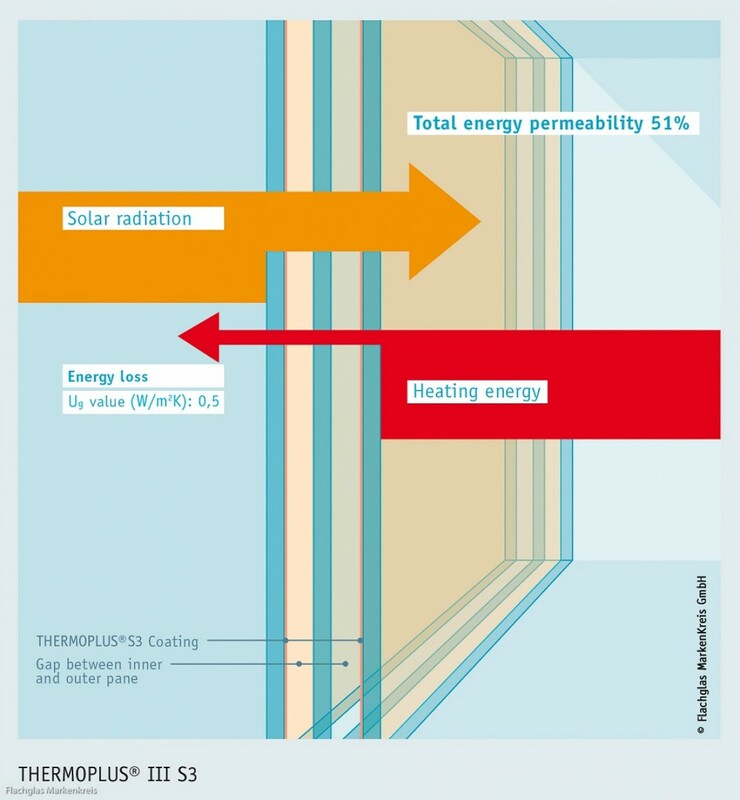 This principle can be illustrated with THERMOPLUS® III S3 where the heat transfer is effectively reduced by two heat-insulating coats of precious metal and two spaces between panes, filled with inert gas. Further heat is obtained from the sunlight. Implemented in its current form, a MEM4WIN window will have a total thickness of 70 mm. The edge seal has been designed so that fittings can be attached directly.